Greenshare 2014 order your ticket before it’s too late! 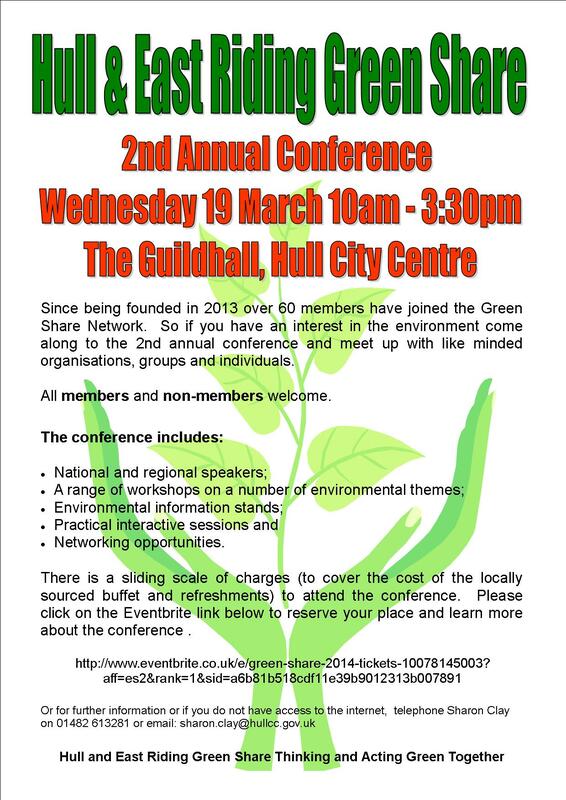 Have you booked your place for the Hull & East Riding Greenshare 2nd Annual Conference? 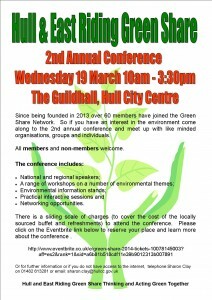 The conference is for any organisations, businesses or individuals with an interest in environmental issues in the broadest sense – all welcome. Throughout the day we will be holding a variety of table discussions each with an environmental theme, you will be invited to choose which ones you would like to attend. · Inglehome: Transforming a typically inefficient Hull terrace into a cosy, low energy superhome with zero bills. Community Resilience: What makes a resilient community and ask people to consider 7 elements identified in the ‘Rainbow of Resilience’ and how that relates to their own geographical community. We will start to uncover what factors make up a strong community and it also a showcase of how to run a pop up mini focus group for community asset mapping. Energy Estuary – Hull’s real role in the energy revolution:We will be discussing the state of UK energy policy including fracking, renewables, biomass and much more and the role of communities to lead the way in creating an affordable, secure and low carbon energy system fit for the challenges of the 21st Century. There will be also the opportunity to take part in practical interactive sessions and networking opportunities. To cover the cost of refreshments and a locally sourced buffet lunch there is a small charge for attending this event. To see the sliding scale of delegate fees and to book your place, please go to the Eventbrite website via the link below. We look forward to seeing you on 19th March. All are welcome to attend ~ you do not have to be a member of the network. Booking is essential. If you have problems using eventbrite please contact Sharon on 613281 or Liz on 613451.